The United States, its friends and allies face a world of complex challenges and great opportunities. Since the terrorist attacks in New York, Washington DC and Pennsylvania seven years ago, we have been engaged in a conflict unlike those that came before. The United States has worked with its partners to defeat the enemies of freedom and prosperity, assist those in greatest need, and lay the foundation for a better tomorrow. Tackling our common challenges requires a clear assessment of the strategic environment and the tools available to construct a durable, flexible, and dynamic strategy. This National Defense Strategy outlines how we will contribute to achieving the National Security Strategy objectives and secure a safer, more prosperous world for the benefit of all. This strategy builds on lessons learned and insights from previous operations and strategic reviews, including the 2006 Quadrennial Defense Review. It represents the distillation of valuable experience across the spectrum of conflict and within the strategic environment. It emphasizes the critical role our partners play - both within the U.S. Gove rnment and internationally - in achieving our common goals. The United States will soon have a new President and Commander-in-Chief, but the complex issues the United States faces will remain. This strategy is a blueprint to succeed in the years to come. A core responsibility of the U.S. Government is to protect the American people - in the words of the framers of our Constitution, to “provide for the common defense.” For more than 230 years, the U.S. Armed Forces have served as a bulwark of liberty, opportunity, and prosperity at home. Beyond our shores, America shoulders additional responsibilities on behalf of the world. For those struggling for a better life, there is and must be no stronger advocate than the United States. We remain a beacon of light for those in dark places, and for this reason we should remember that our actions and words signal the depth of our strength and resolve. For our friends and allies, as well as for our enemies and potential adversaries, our commitment to democratic values must be matched by our deeds. The spread of liberty both manifests our ideals and protects our interests. The President’s 2006 National Security Strategy (NSS) describes an approach founded on two pillars: promoting freedom, justice, and human dignity by working to end tyranny, promote effective democracies, and extend prosperity; and confronting the challenges of our time by leading a growing community of democracies. It seeks to foster a world of well-governed states that can meet the needs of their citizens and conduct themselves responsibly in the international system. This approach represents the best way to provide enduring security for the American people. 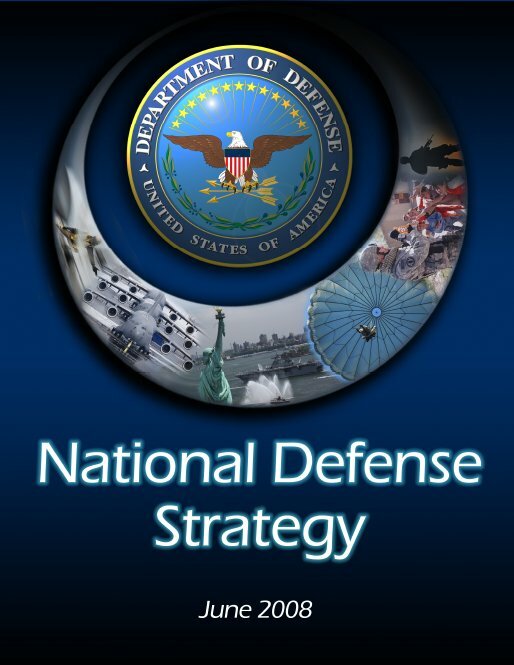 The National Defense Strategy (NDS) serves as the Department’s capstone document in this long-term effort. It flows from the NSS and informs the National Military Strategy. It also provides a framework for other DoD strategic guidance, specifically on campaign and contingency planning, force development, and intelligence. It reflects the results of the 2006 Quadrennial Defense Review (QDR) and lessons learned from on-going operations in Iraq, Afghanistan, and elsewhere. It addresses how the U.S. Armed Forces will fight and win America’s wars and how we seek to work with and through partner nations to shape opportunities in the international environment to enhance security and avert conflict. The NDS describes our overarching goals and strategy. It outlines how DoD will support the objectives outlined in the NSS, including the need to strengthen alliances and build new partnerships to defeat global terrorism and prevent attacks against us, our allies, and our friends; prevent our enemies from threatening us, our allies, and our friends with weapons of mass destruction (WMD); work with others to defuse regional conflicts, including conflict intervention; and transform national security institutions to face the challenges of the 21st century. The NDS acts on these objectives, evaluates the strategic environment, challenges, and risks we must consider in achieving them, and maps the way forward. For the foreseeable future, this environment will be defined by a global struggle against a violent extremist ideology that seeks to overturn the international state system. Beyond this transnational struggle, we face other threats, including a variety of irregular challenges, the quest by rogue states for nuclear weapons, and the rising military power of other states. These are long-term challenges. Success in dealing with them will require the orchestration of national and international power over years or decades to come. Violent extremist movements such as al-Qaeda and its associates comprise a complex and urgent challenge. Like communism and fascism before it, today’s violent extremist ideology rejects the rules and structures of the international system. Its adherents reject state sovereignty, ignore borders, and attempt to deny self-determination and human dignity wherever they gain power. These extremists opportunistically exploit respect for these norms for their own purposes, hiding behind international norms and national laws when it suits them, and attempting to subvert them when it does not. Combating these violent groups will require long- term, innovative approaches. The inability of many states to police themselves effectively or to work with their neighbors to ensure regional security represents a challenge to the international system. Armed sub-national groups, including but not limited to those inspired by violent extremism, threaten the stability and legitimacy of key states. If left unchecked, such instability can spread and threaten regions of interest to the United States, our allies, and friends. Insurgent groups and other non-state actors frequently exploit local geographical, political, or social conditions to establish safe havens from which they can operate with impunity. Ungoverned, under- governed, misgoverned, and contested areas offer fertile ground for such groups to exploit the gaps in governance capacity of local regimes to undermine local stability and regional security. Addressing this problem will require local partnerships and creative approaches to deny extremists the opportunity to gain footholds. Rogue states such as Iran and North Korea similarly threaten international order. The Iranian regime sponsors terrorism and is attempting to disrupt the fledgling democracies in Iraq and Afghanistan. Iran’s pursuit of nuclear technology and enrichment capabilities poses a serious challenge to security in an already volatile region. The North Korean regime also poses a serious nuclear and missile proliferation concern for the U.S. and other responsible international stakeholders. The regime threatens the Republic of Korea with its military and its neighbors with its missiles. Moreover, North Korea creates instability with its illicit activity, such as counterfeiting U.S. currency and trafficking in narcotics, and brutal treatment of its own people. We must also consider the possibility of challenges by more powerful states. Some may actively seek to counter the United States in some or all domains of traditional warfare or to gain an advantage by developing capabilities that offset our own. Others may choose niche areas of military capability and competition in which they believe they can develop a strategic or operational advantage. That some of these potential competitors also are partners in any number of diplomatic, commercial, and security efforts will only make these relationships more difficult to manage. China is one ascendant state with the potential for competing with the United States. For the foreseeable future, we will need to hedge against China’s growing military modernization and the impact of its strategic choices upon international security. It is likely that China will continue to expand its conventional military capabilities, emphasizing anti-access and area denial assets including developing a full range of long-range strike, space, and information warfare capabilities. Our interaction with China will be long-term and multi-dimensional and will involve peacetime engagement between defense establishments as much as fielded combat capabilities. The objective of this effort is to mitigate near term challenges while preserving and enhancing U.S. national advantages over time. Russia’s retreat from openness and democracy could have significant security implications for the United States, our European allies, and our partners in other regions. Russia has leveraged the revenue from, and access to, its energy sources; asserted claims in the Arctic; and has continued to bully its neighbors, all of which are causes for concern. Russia also has begun to take a more active military stance, such as the renewal of long-range bomber flights, and has withdrawn from arms control and force reduction treaties, and even threatened to target countries hosting potential U.S. anti-missile bases. Furthermore, Moscow has signaled an increasing reliance on nuclear weapons as a foundation of its security. All of these actions suggest a Russia exploring renewed influence, and seeking a greater international role. U.S. dominance in conventional warfare has given prospective adversaries, particularly non-state actors and their state sponsors, strong motivation to adopt asymmetric methods to counter our advantages. For this reason, we must display a mastery of irregular warfare comparable to that which we possess in conventional combat. Our adversaries also seek to develop or acquire catastrophic capabilities: chemical, biological, and especially nuclear weapons. In addition, they may develop disruptive technologies in an attempt to offset U.S. advantages. For example, the development and proliferation of anti-access technology and weaponry is worrisome as it can restrict our future freedom of action. These challenges could come not only in the obvious forms we see today but also in less traditional forms of influence such as manipulating global opinion using mass communications venues and exploiting international commitments and legal avenues. Meeting these challenges require better and more diverse capabilities in both hard and soft power, and greater flexibility and skill in employing them. These modes of warfare may appear individually or in combination, spanning the spectrum of warfare and intertwining hard and soft power. In some instances, we may not learn that a conflict is underway until it is well advanced and our options limited. We must develop better intelligence capabilities to detect, recognize, and analyze new forms of warfare as well as explore joint approaches and strategies to counter them. Increasingly, the Department will have to plan for a future security environment shaped by the interaction of powerful strategic trends. These trends suggest a range of plausible futures, some presenting major challenges and security risks. Over the next twenty years physical pressures - population, resource, energy, climatic and environmental - could combine with rapid social, cultural, technological and geopolitical change to create greater uncertainty. This uncertainty is exacerbated by both the unprecedented speed and scale of change, as well as by the unpredictable and complex interaction among the trends themselves. Globalization and growing economic interdependence, while creating new levels of wealth and opportunity, also create a web of interrelated vulnerabilities and spread risks even further, increasing sensitivity to crises and shocks around the globe and generating more uncertainty regarding their speed and effect. Current defense policy must account for these areas of uncertainty. As we plan, we must take account of the implications of demographic trends, particularly population growth in much of the developing world and the population deficit in much of the developed world. The interaction of these changes with existing and future resource, environmental, and climate pressures may generate new security challenges. Furthermore, as the relative balance of economic and military power between states shifts, some propelled forward by economic development and resource endowment, others held back by physical pressures or economic and political stagnation, new fears and insecurities will arise, presenting new risks for the international community. These risks will require managing the divergent needs of massively increasing energy demand to maintain economic development and the need to tackle climate change. Collectively, these developments pose a new range of challenges for states and societies. These trends will affect existing security concerns such as international terrorism and weapons proliferation. At the same time, overlaying these trends will be developments within science and technology, which, while presenting some potential threats, suggest a range of positive developments that may reduce many of the pressures and risks suggested by physical trends. How these trends interact and the nature of the shocks they might generate is uncertain; the fact that they will influence the future security environment is not. Whenever possible, the Department will position itself both to respond to and reduce uncertainty. This means we must continue to improve our understanding of trends, their interaction, and the range of risks the Department may be called upon to respond to or manage. We should act to reduce risks by shaping the development of trends through the decisions we make regarding the equipment and capabilities we develop and the security cooperation, reassurance, dissuasion, deterrence, and operational activities we pursue. The Department should also develop the military capability and capacity to hedge against uncertainty, and the institutional agility and flexibility to plan early and respond effectively alongside interdepartmental, non-governmental and international partners. Since World War II, the United States has acted as the primary force to maintain international security and stability, leading first the West in the Cold War confrontation with the Soviet Union and, more recently, international efforts to confront violent extremism. This has been accomplished through military, diplomatic, and economic means. Driving these efforts has been a set of enduring national interests and a vision of opportunity and prosperity for the future. U.S. interests include protecting the nation and our allies from attack or coercion, promoting international security to reduce conflict and foster economic growth, and securing the global commons and with them access to world markets and resources. To pursue these interests, the U.S. has developed military capabilities and alliances and coalitions, participated in and supported international security and economic institutions, used diplomacy and soft power to shape the behavior of individual states and the international system, and using force when necessary. These tools help inform the strategic framework with which the United States plans for the future, and help us achieve our ends. The security of the United States is tightly bound up with the security of the broader international system. As a result, our strategy seeks to build the capacity of fragile or vulnerable partners to withstand internal threats and external aggression while improving the capacity of the international system itself to withstand the challenge posed by rogue states and would-be hegemons. The core responsibility of the Department of Defense is to defend the United States from attack upon its territory at home and to secure its interests abroad. The U.S. Armed Forces protect the physical integrity of the country through an active layered defense. They also deter attacks upon it, directly and indirectly, through deployments at sea, in the air, on land, and in space. However, as the spreading web of globalization presents new opportunities and challenges, the importance of planning to protect the homeland against previously unexpected threats increases. Meeting these challenges also creates a tension between the need for security and the requirements of openness in commerce and civil liberties. On the one hand, the flow of goods, services, people, technology and information grows every year, and with it the openness of American society. On the other hand, terrorists and others wishing us harm seek to exploit that openness. While defending the homeland in depth, the Department must also maintain the capacity to support civil authorities in times of national emergency such as in the wake of catastrophic natural and man-made disasters. The Department will continue to maintain consequence management capabilities and plan for their use to support government agencies. Effective execution of such assistance, especially amid simultaneous, multi-jurisdictional disasters, requires ever-closer working relationships with other departments and agencies, and at all levels of government. To help develop and cultivate these working relationships, the Department will continue to support the Department of Homeland Security (DHS), which is responsible for coordinating the Federal response to disasters. DoD must also reach out to non-governmental agencies and private sector entities that play a role in disaster response and recovery. For the foreseeable future, winning the Long War against violent extremist movements will be the central objective of the U.S. We must defeat violent extremism as a threat to our way of life as a free and open society and foster an environment inhospitable to violent extremists and all those who support them. We face an extended series of campaigns to defeat violent extremist groups, presently led by al-Qaeda and its associates. In concert with others, we seek to reduce support for violent extremism and encourage moderate voices, offering a positive alternative to the extremists’ vision for the future. Victory requires us to apply all elements of national power in partnership with old allies and new partners. Iraq and Afghanistan remain the central fronts in the struggle, but we cannot lose sight of the implications of fighting a long-term, episodic, multi-front, and multi-dimensional conflict more complex and diverse than the Cold War confrontation with communism. Success in Iraq and Afghanistan is crucial to winning this conflict, but it alone will not bring victory. We face a clash of arms, a war of ideas, and an assistance effort that will require patience and innovation. In concert with our partners, we must maintain a long-term commitment to undermining and reducing the sources of support for extremist groups, and to countering the ideological totalitarian messages they build upon. We face a global struggle. Like communism and fascism before it, extremist ideology has transnational pretensions, and like its secular antecedents, it draws adherents from around the world. The vision it offers is in opposition to globalization and the expansion of freedom it brings. Paradoxically, violent extremist movements use the very instruments of globalization - the unfettered flow of information and ideas, goods and services, capital, people, and technology - that they claim to reject to further their goals. Although driven by this transnational ideology, our adversaries themselves are, in fact, a collection of regional and local extremist groups. Regional and local grievances help fuel the conflict, and it thrives in ungoverned, under-governed, and mis-governed areas. This conflict is a prolonged irregular campaign, a violent struggle for legitimacy and influence over the population. The use of force plays a role, yet military efforts to capture or kill terrorists are likely to be subordinate to measures to promote local participation in government and economic programs to spur development, as well as efforts to understand and address the grievances that often lie at the heart of insurgencies. For these reasons, arguably the most important military component of the struggle against violent extremists is not the fighting we do ourselves, but how well we help prepare our partners to defend and govern themselves. Working with and through local actors whenever possible to confront common security challenges is the best and most sustainable approach to combat violent extremism. Often our partners are better positioned to handle a given problem because they understand the local geography, social structures, and culture better than we do or ever could. In collaboration with interagency and international partners we will assist vulnerable states and local populations as they seek to ameliorate the conditions that foster extremism and dismantle the structures that support and allow extremist groups to grow. We will adopt approaches tailored to local conditions that will vary considerably across regions. We will help foster security and aid local authorities in building effective systems of representational government. By improving conditions, undermining the sources of support, and assisting in addressing root causes of turmoil, we will help states stabilize threatened areas. Countering the totalitarian ideological message of terrorist groups to help further undermine their potency will also require sensitive, sophisticated and integrated interagency and international efforts. The Department will support and facilitate these efforts. The struggle against violent extremists will not end with a single battle or campaign. Rather, we will defeat them through the patient accumulation of quiet successes and the orchestration of all elements of national and international power. We will succeed by eliminating the ability of extremists to strike globally and catastrophically while also building the capacity and resolve of local governments to defeat them regionally. Victory will include discrediting extremist ideology, creating fissures between and among extremist groups and reducing them to the level of nuisance groups that can be tracked and handled by law enforcement capabilities. The best way to achieve security is to prevent war when possible and to encourage peaceful change within the international system. Our strategy emphasizes building the capacities of a broad spectrum of partners as the basis for long-term security. We must also seek to strengthen the resiliency of the international system to deal with conflict when it occurs. We must be prepared to deal with sudden disruptions, to help prevent them from escalating or endangering international security, and to find ways to bring them swiftly to a conclusion. Local and regional conflicts in particular remain a serious and immediate problem. They often spread and may exacerbate transnational problems such as trafficking in persons, drug-running, terrorism, and the illicit arms trade. Rogue states and extremist groups often seek to exploit the instability caused by regional conflict, and state collapse or the emergence of ungoverned areas may create safe havens for these groups. The prospect that instability and collapse in a strategic state could provide extremists access to weapons of mass destruction or result in control of strategic resources is a particular concern. To preclude such calamities, we will help build the internal capacities of countries at risk. We will work with and through like-minded states to help shrink the ungoverned areas of the world and thereby deny extremists and other hostile parties sanctuary. By helping others to police themselves and their regions, we will collectively address threats to the broader international system. We must also address the continuing need to build and support long-term international security. As the 2006 NSS underscores, relations with the most powerful countries of the world are central to our strategy. We seek to pursue U.S. interests within cooperative relationships, not adversarial ones, and have made great progress. For example, our relationship with India has evolved from an uneasy co-existence during the Cold War to a growing partnership today. We wish to use the opportunity of an absence of fundamental conflict between great powers to shape the future, and to prevent the re-emergence of great power rivalry. The United States welcomes the rise of a peaceful and prosperous China, and it encourages China to participate as a responsible stakeholder by taking on a greater share of burden for the stability, resilience, and growth of the international system. However, much uncertainty surrounds the future course China’s leaders will set for their country. Accordingly, the NSS states that “our strategy seeks to encourage China to make the right strategic choices for its people, while we hedge against other possibilities.” A critical component of this strategy is the establishment and pursuit of continuous strategic dialogue with China to build understanding, improve communication, and to reduce the risk of miscalculation. China continues to modernize and develop military capabilities primarily focused on a Taiwan Strait conflict, but which could have application in other contingencies. The Department will respond to China’s expanding military power, and to the uncertainties over how it might be used, through shaping and hedging. This approach tailors investment of substantial, but not infinite, resources in ways that favor key enduring U.S. strategic advantages. At the same time, we will continue to improve and refine our capabilities to respond to China if necessary. We will continue to press China to increase transparency in its defense budget expenditures, strategies, plans and intentions. We will work with other elements of the U.S. Government to develop a comprehensive strategy to shape China’s choices. In addition, Russia’s retreat from democracy and its increasing economic and political intimidation of its neighbors give cause for concern. We do not expect Russia to revert to outright global military confrontation, but the risk of miscalculation or conflict arising out of economic coercion has increased. We also share interests with Russia, and can collaborate with it in a variety of ways. We have multiple opportunities and venues to mold our security relationship and to cooperate - such as in countering WMD proliferation and extremist groups. At the same time, we will seek other ways to encourage Russia to act as a constructive partner, while expressing our concerns over policies and aspects of its international behavior such as the sale of disruptive weapons technologies and interference in and coercion of its neighbors. Both China and Russia are important partners for the future and we seek to build collaborative and cooperative relationships with them. We will develop strategies across agencies, and internationally, to provide incentives for constructive behavior while also dissuading them from destabilizing actions. Deterrence is key to preventing conflict and enhancing security. It requires influencing the political and military choices of an adversary, dissuading it from taking an action by making its leaders understand that either the cost of the action is too great, is of no use, or unnecessary. Deterrence also is based upon credibility: the ability to prevent attack, respond decisively to any attack so as to discourage even contemplating an attack upon us, and strike accurately when necessary. For nearly half a century, the United States approached its security focused on a single end: deterring the Soviet Union from attacking the United States and our allies in what could have escalated into a global thermonuclear catastrophe. To that purpose we built our deterrent upon a diverse and survivable nuclear force, coupled with a potent conventional capability, designed to counter the military power of one adversary. Likewise, our assumptions and calculations for shaping deterrence were based largely upon our understanding of the dynamics and culture of the Soviet Union alone. All potential conflict was subsumed and influenced by that confrontation and the fear of escalation within it. Even so, there were limits. Military capabilities alone were, and are, no panacea to deter all conflict: despite the enormous strength of both the United States and the Soviet Union, conflicts arose; some were defused, while others spilled over into local wars. We must tailor deterrence to fit particular actors, situations, and forms of warfare. The same developments that add to the complexity of the challenge also offer us a greater variety of capabilities and methods to deter or dissuade adversaries. This diversity of tools, military and non-military, allows us to create more plausible reactions to attacks in the eyes of opponents and a more credible deterrence to them. In addition, changes in capabilities, especially new technologies, permit us to create increasingly credible defenses to convince would-be attackers that their efforts are ultimately futile. Our ability to deter attack credibly also reassures the American people and our allies of our commitment to defend them. For this reason, deterrence must remain grounded in demonstrated military capabilities that can respond to a broad array of challenges to international security. For example, the United States will maintain its nuclear arsenal as a primary deterrent to nuclear attack, and the New Triad remains a cornerstone of strategic deterrence. We must also continue to field conventional capabilities to augment or even replace nuclear weapons in order to provide our leaders a greater range of credible responses. Missile defenses not only deter an attack, but can defend against such an attack should deterrence fail. Precision-guided munitions allow us great flexibility not only to react to attacks, but also to strike preemptively when necessary to defend ourselves and our allies. Yet we must also recognize that deterrence has its limits, especially where our interests are ill-defined or the targets of our deterrence are difficult to influence. Deterrence may be impossible in cases where the value is not in the destruction of a target, but the attack and the very means of attack, as in terrorism. We must build both our ability to withstand attack - a fundamental and defensive aspect of deterrence - and improve our resiliency beyond an attack. An important change in planning for the myriad of future potential threats must be post-attack recovery and operational capacity. This, too, helps demonstrate that such attacks are futile, as does our ability to respond with strength and effectiveness to attack. For the future, the global scope of problems, and the growing complexity of deterrence in new domains of conflict, will require an integrated interagency and international approach if we are to make use of all the tools available to us. We must consider which non-lethal actions constitute an attack on our sovereignty, and which may require the use of force in response. We must understand the potential for escalation from non-lethal to lethal confrontation, and learn to calculate and manage the associated risks. Despite our best efforts at prevention and deterrence, we must be prepared to act together with like minded states against states when they threaten their neighbors, provide safe haven to terrorists, or pursue destabilizing weapons. Although improving the U.S. Armed Forces’ proficiency in irregular warfare is the Defense Department’s top priority, the United States does not have the luxury of preparing exclusively for such challenges. Even though the likelihood of interstate conflict has declined in recent years, we ignore it at our peril. Current circumstances in Southwest Asia and on the Korean Peninsula, for example, demonstrate the continuing possibility of conflict. When called upon, the Department must be positioned to defeat enemies employing a combination of capabilities, conventional and irregular, kinetic and non-kinetic, across the spectrum of conflict. We must maintain the edge in our conventional forces. Rogue states will remain a threat to U.S. regional interests. Iran and North Korea continue to exert coercive pressure in their respective regions, where each seek to challenge or reduce U.S. influence. Responding to and, as necessary, defeating these, and potentially other, rogue states will remain a major challenge. We must maintain the capabilities required to defeat state adversaries, including those armed with nuclear weapons. We will achieve our objectives by shaping the choices of key states, preventing adversaries from acquiring or using WMD, strengthening and expanding alliances and partnerships, securing U.S. strategic access and retaining freedom of action, and integrating and unifying our efforts. Although the role of non-state actors in world affairs has increased, states will continue to be the basis of the international order. In cooperation with our allies and friends, the United States can help shape the international environment, the behavior of actors, and the choices that strategic states face in ways that foster accountability, cooperation, and mutual trust. Shaping choices contributes to achieving many of our objectives. It is critical to defending the homeland by convincing key states that attacking the United States would be futile and ultimately self-defeating. Our deterrence posture is designed to persuade potential aggressors that they cannot meet their objectives through an attack on the United States and that such actions would result in an overwhelming response. Our posture and capabilities also contribute to deterring conflict of other types, particularly with potential adversary states. We can also promote security by helping shape the choices that strategic states make, encouraging them to avoid destabilizing paths and adhering to international norms on the use of force, the promotion of peace and amity, and acting as good stewards of the public good within their own borders. We shall seek to anchor China and Russia as stakeholders in the system. Similarly, we look to India to assume greater responsibility as a stakeholder in the international system, commensurate with its growing economic, military, and soft power. There are few greater challenges than those posed by chemical, biological, and particularly nuclear weapons. Preventing the spread of these weapons, and their use, requires vigilance and obligates us to anticipate and counter threats. Whenever possible, we prefer non-military options to achieve this purpose. We combine non-proliferation efforts to deny these weapons and their components to our adversaries, active efforts to defend against and defeat WMD and missile threats before they are unleashed, and improved protection to mitigate the consequences of WMD use. We also seek to convince our adversaries that they cannot attain their goals with WMD, and thus should not acquire such weapons in the first place. However, as the NSS states, the United States will, if necessary, act preemptively in exercising its right of self-defense to forestall or prevent hostile acts by our adversaries. Reducing the proliferation of WMD and bolstering norms against their use contribute to defending the homeland by limiting the number of states that can directly threaten us and dissuading the potential transfer of these weapons to non- state actors. As we and our partners limit WMD proliferation, we will deny terrorists a potent weapon and contribute to bringing the fight against violent extremists to a successful conclusion on U.S. terms. A number of hostile or potentially hostile states are actively seeking or have acquired WMD. Some may seek them for prestige or deterrence; others may plan to use them. Preventing such regimes from acquiring or proliferating WMD, and the means to deliver them, contributes to promoting security. Fortunately, the ranks of the nuclear powers are still small, but they could grow in the next decade in the absence of concerted action. Many more countries possess chemical and biological weapons programs - programs that are more difficult to detect, impede, or eliminate. These countries will continue to pursue WMD programs as a means to deter, coerce, and potentially use against adversaries. Shaping the behavior of additional states seeking or acquiring weapons of mass destruction will require an integrated, international effort. Technological and information advances of the last fifty years have led to the wide dissemination of WMD knowledge and lowered barriers to entry. Relatively sophisticated chemical agents, and even crude biological agents, are within the reach of many non-state actors with a modicum of scientific knowledge. Non-state actors may acquire WMD, either through clandestine production, state- sponsorship, or theft. Also of concern is the potential for severe instability in WMD states and resulting loss of control of these weapons. In these cases, the United States, through a concerted interagency and partner nation effort, must be prepared to detect, tag and track, intercept, and destroy WMD and related materials. We must also be prepared to act quickly to secure those weapons and materials in cases where a state loses control of its weapons, especially nuclear devices. Should the worst happen, and we are attacked, we must be able to sustain operations during that attack and help mitigate the consequences of WMD attacks at home or overseas. The United States also must strengthen and expand alliances and partnerships. The U.S. alliance system has been a cornerstone of peace and security for more than a generation and remains the key to our success, contributing significantly to achieving all U.S. objectives. Allies often possess capabilities, skills, and knowledge we cannot duplicate. We should not limit ourselves to the relationships of the past. We must broaden our ideas to include partnerships for new situations or circumstances, calling on moderate voices in troubled regions and unexpected partners. In some cases, we may develop arrangements limited to specific objectives or goals, or even of limited duration. Although these arrangements will vary according to mutual interests, they should be built on respect, reciprocity, and transparency. The capacities of our partners vary across mission areas. We will be able to rely on many partners for certain low-risk missions such as peacekeeping and humanitarian assistance, whereas complex counterinsurgency and high-end conventional operations are likely to draw on fewer partners with the capacity, will, and capability to act in support of mutual goals. We will support, train, advise and equip partner security forces to counter insurgencies, terrorism, proliferation, and other threats. We will assist other countries in improving their capabilities through security cooperation, just as we will learn valuable skills and information from others better situated to understand some of the complex challenges we face together. We must also work with longstanding friends and allies to transform their capabilities. Key to transformation is training, education and, where appropriate, the transfer of defense articles to build partner capacity. We must work to develop new ways of operating across the full spectrum of warfare. Our partnerships must be capable of applying military and non-military power when and where needed - a prerequisite against an adaptable transnational enemy. For more than sixty years, the United States has secured the global commons for the benefit of all. Global prosperity is contingent on the free flow of ideas, goods, and services. The enormous growth in trade has lifted millions of people out of poverty by making locally produced goods available on the global market. Low barriers to trade also benefit consumers by reducing the cost of goods and allowing countries to specialize. None of this is possible without a basic belief that goods shipped through air or by sea, or information transmitted under the ocean or through space, will arrive at their destination safely. The development and proliferation of anti-access technologies and tactics threatens to undermine this belief. The United States requires freedom of action in the global commons and strategic access to important regions of the world to meet our national security needs. The well-being of the global economy is contingent on ready access to energy resources. Notwithstanding national efforts to reduce dependence on oil, current trends indicate an increasing reliance on petroleum products from areas of instability in the coming years, not reduced reliance. The United States will continue to foster access to and flow of energy resources vital to the world economy. Further, the Department is examining its own energy demands and is taking action to reduce fuel demand where it will not negatively affect operational capability. Such efforts will reduce DoD fuel costs and assist wider U.S. Government energy security and environmental objectives. We will continue to transform overseas U.S. military presence through global defense posture realignment, leveraging a more agile continental U.S. (CONUS)- based expeditionary total force and further developing a more relevant and flexible forward network of capabilities and arrangements with allies and partners to ensure strategic access. Our efforts require a unified approach to both planning and implementing policy. Iraq and Afghanistan remind us that military success alone is insufficient to achieve victory. We must not forget our hard-learned lessons or allow the important soft power capabilities developed because of them to atrophy or even disappear. Beyond security, essential ingredients of long-term success include economic development, institution building, and the rule of law, as well as promoting internal reconciliation, good governance, providing basic services to the people, training and equipping indigenous military and police forces, strategic communications. We as a nation must strengthen not only our military capabilities, but also reinvigorate other important elements of national power and develop the capability to integrate, tailor, and apply these tools as needed. We must tap the full strength of America and its people. The Department of Defense has taken on many of these burdens. Our forces have stepped up to the task of long-term reconstruction, development and governance. The U.S. Armed Forces will need to institutionalize and retain these capabilities, but this is no replacement for civilian involvement and expertise. The United States must improve its ability to deploy civilian expertise rapidly, and continue to increase effectiveness by joining with organizations and people outside of government - untapped resources with enormous potential. We can make better use of the expertise of our universities and of industry to assist in reconstruction and long-term improvements to economic vitality and good governance. Greater civilian participation is necessary both to make military operations successful and to relieve stress on the men and women of the armed forces. Having permanent civilian capabilities available and using them early could also make it less likely that military forces will need to be deployed in the first place. We also need capabilities to meet the challenges of the 21st century. Strategic communications within the Department and across government is a good example. Although the United States invented modern public relations, we are unable to communicate to the world effectively who we are and what we stand for as a society and culture, about freedom and democracy, and about our goals and aspirations. This capability is and will be crucial not only for the Long War, but also for the consistency of our message on crucial security issues to our allies, adversaries, and the world. We will continue to work with other U.S. Departments and Agencies, state and local governments, partners and allies, and international and multilateral organizations to achieve our objectives. A whole-of-government approach is only possible when every government department and agency understands the core competencies, roles, missions, and capabilities of its partners and works together to achieve common goals. Examples such as expanding U.S. Southern Command’s interagency composition and the establishment of U.S. Africa Command will point the way. In addition, we will support efforts to coordinate national security planning more effectively, both within DoD and across other U.S. Departments and Agencies. We will continue to work to improve understanding and harmonize best practices amongst interagency partners. This must happen at every level from Washington, DC-based headquarters to the field. DoD, in partnership with DHS, also will continue to develop habitual relationships with state and local authorities to ensure we are positioned to respond when necessary and support civil authorities in times of emergency, where allowable by law. Through these efforts we will significantly increase our collective abilities to defend the homeland. We will further develop and refine our own capabilities. We should continue to develop innovative capabilities, concept, and organizations. We will continue to rely on adaptive planning, on integration and use of all government assets, and on flexibility and speed. Yet we must not only have a full spectrum of capabilities at our disposal, but also employ and tailor any or all of them to a complex environment. These developments will require an expanded understanding of “jointness,” one that seamlessly combines civil and military capabilities and options. Finally, we must consider further realigning Department structures, and interagency planning and response efforts, to better address these risks and to meet new needs. We will examine how integrated planning is conducted within the Department, and how to make better use of our own existing capacities. Implementation of any strategy is predicated on developing, maintaining and, where possible, expanding the means required to execute its objectives within budget constraints. Without the tools, we cannot do the job. The Department is well equipped for its primary missions, but it always seeks to improve and refine capabilities and effectiveness. The challenges before us will require resourcefulness and an integrated approach that wisely balances risks and assets, and that recognizes where we must improve, and where others are better suited to help implement aspects of the strategy. The Department will continue to emphasize the areas identified in the 2006 QDR, specifically improvements in capabilities for defeating terrorist networks, defending the homeland in depth, shaping the choices of countries at strategic crossroads, and preventing adversaries’ acquisition and use of weapons of mass destruction. Although these capabilities are not sufficient to address all the missions of the Department, they require particular attention. The Department’s greatest asset is the people who dedicate themselves to the mission. The Total Force distributes and balances skills across each of its constituent elements: the Active Component, the Reserve Component, the civilian workforce, and the private sector and contractor base. Each element relies on the other to accomplish the mission; none can act independently of the other to accomplish the mission. The force has been severely tasked between operations in Iraq and Afghanistan, and fulfilling other missions and assignments. Although we are already committed to strengthening our forces, we also should seek to find more ways to retain and tap into the unique skills and experience of the thousands of veterans and others who have served and who can provide valuable contributions to national security. We will continue to pursue the improvements in the total force identified in the 2006 QDR and elsewhere, including the expansion of special operations forces and ground forces and developing modular, adaptable joint forces. Strategic communications will play an increasingly important role in a unified approach to national security. DoD, in partnership with the Department of State, has begun to make strides in this area, and will continue to do so. However, we should recognize that this is a weakness across the U.S. Government, and that a coordinated effort must be made to improve the joint planning and implementation of strategic communications. Intelligence and information sharing have always been a vital component of national security. Reliable information and analysis, quickly available, is an enduring challenge. As noted in the 2006 QDR, DoD is pursuing improved intelligence capabilities across the spectrum, such as defense human intelligence focused on identifying and penetrating terrorist networks and measurement and signature intelligence to identify WMD and delivery systems. Technology and equipment are the tools of the Total Force, and we must give our people what they need, and the best resources, to get the job done. First-class technology means investing in the right kinds of technology at the right time. Just as our adversaries adapt and develop new tactics, techniques, and procedures, we too must be nimble and creative. One area of particular focus is developing the means to locate, tag and track WMD components. We also must continue to improve our acquisition and contracting regulations, procedures, and oversight to ensure agile and timely procurement of critical equipment and materials for our forces. Organization also is a key to the DoD’s success, especially as it brings together disparate capabilities and skills to wield as a unified and overpowering force. Concepts such as “net-centricity” can help guide DoD, linking components of the Department together and connecting organizations with complementary core competencies, forging the Total Force into more than the sum of its parts. The goal is to break down barriers and transform industrial-era organizational structures into an information and knowledge-based enterprise. These concepts are not a panacea, and will require investments in people as much as in technology to realize the full potential of these initiatives. Strengthening our burgeoning system of alliances and partnerships is essential to implementing our strategy. We have become more integrated with our allies and partners on the battlefield and elsewhere. Whether formal alliances such as NATO or newer partnerships such as the Proliferation Security Initiative, they have proved their resiliency and adaptability. These relationships continue to evolve, ensuring their relevance as new challenges emerge. Our partners provide resources, knowledge, skills, and capabilities we cannot duplicate. Building these partnerships takes resources. DoD has worked with its interagency partners and Congress to expand the portfolio of security cooperation and partnership capacity building tools over the last seven years and will continue to do so. These tools are essential to successful implementation of the strategy. We will also work with Congress and other stakeholders to address our significant concern with growing legal and regulatory restrictions that impede, and threaten to undermine, our military readiness. DoD will continue to implement global defense posture realignment, transforming from legacy base structures and forward-garrisoned forces to an expeditionary force, providing greater flexibility to contend with uncertainty in a changing strategic environment. Implementing the National Defense Strategy and its objectives requires balancing risks, and understanding the choices those risks imply. We cannot do everything, or function equally well across the spectrum of conflict. Ultimately we must make choices. With limited resources, our strategy must address how we assess, mitigate, and respond to risk. Here we define risk in terms of the potential for damage to national security combined with the probability of occurrence and a measurement of the consequences should the underlying risk remain unaddressed. We must hedge against changes in the strategic environment that might invalidate the assumptions underpinning the strategy as well as address risks to the strategy. First, there are risks associated with the indirect approach that is fundamental to the Long War. We must recognize that partner contributions to future coalition operations will vary in size, composition, competence, and capability. Some partners will have the political will and the capacity and capability to make significant contributions across the spectrum of conflict. Other partners will demonstrate more restraint in the type of operation (e.g., counter-terrorism, stabilization, traditional combat operations) in which they will participate. We must balance the clear need for partners - the Long War is ultimately not winnable without them - with mission requirements for effectiveness and efficiency. Additionally, the strategic shocks identified above could potentially change the rules of the game and require a fundamental re-appraisal of the strategy. • Operational risks are those associated with the current force executing the strategy successfully within acceptable human, material, financial, and strategic costs. • Future challenges risks are those associated with the Department’s capacity to execute future missions successfully against an array of prospective future challengers. • Force management risks are those associated with managing military forces fulfilling the objectives described in this National Defense Strategy. The primary concern here is recruiting, retaining, training, and equipping a force and sustaining its readiness. • Institutional risks are those associated with the capacity of new command, management, and business practices. To address the potential for multiple contingencies, the Department will develop a range of military options for the President, including means to de-escalate crises and reduce demand on forces where possible. Addressing operational risk requires clearly articulating the risks inherent in and the consequences of choosing among the options and proposing mitigation strategies. U.S. predominance in traditional warfare is not unchallenged, but is sustainable for the medium term given current trends. The 2006 QDR focused on non-traditional or irregular challenges. We will continue to focus our investments on building capabilities to address these other challenges, while examining areas where we can assume greater risk. The Department will invest in hedging against the loss or disruption of our traditional advantages, not only through developing mitigation strategies, but also by developing alternative or parallel means to the same end. This diversification parallelism is distinct from acquiring overmatch capabilities (whereby we have much more than an adversary of a similar capability). It will involve pursuing multiple routes to similar effects while ensuring that such capabilities are applicable across multiple mission areas. The people of our Total Force are the greatest asset of the Department. Ensuring that each person has the opportunity to contribute to the maximum of their potential is critical to achieving DoD’s objectives and supporting U.S. national security. An all-volunteer force is the foundation of the most professional and proficient fighting force in the world. It also underlines the necessity to innovate in providing opportunities for advancement and growth. Our civilian and military workforce similarly possesses skills that are highly prized in the private sector, thus requiring a concerted strategy to retain these professionals. Retaining well-trained, motivated military and civilian personnel is key. Financial incentives only go so far. Our military and civilian personnel elect to serve their country unselfishly. It is the responsibility of our senior leaders to recognize that fact and provide the means for personnel to grow, develop new knowledge, and develop new skills. Since 2001, the Department has created new commands (integrating Space and Strategic Commands, establishing Northern and Africa Commands) and new governance structures. DoD is already a complex organization. We must guard against increasing organizational complexity leading to redundancy, gaps, or overly bureaucratic decision-making processes. The strategy contained in this document is the result of an assessment of the current and future strategic environment. The United States, and particularly the Department of Defense, will not win the Long War or successfully address other security challenges alone. Forging a new consensus for a livable world requires constant effort and unity of purpose with our Allies and partners. The Department stands ready to fulfill its mission.